Prince Harry and Meghan Markle were sent golden tickets to tour a Peeps factory. Upon learning Prince Harry had never toasted a marshmallow, Peeps put out a Willy Wonka-esque invitation for the royal family member and his fiancé Meghan Markle to tour a Peeps factory. An article published on October 23 by People.com about Prince Harry visiting a nature preserve in the U.K. inspired the idea for the campaign. The prince, a known outdoorsman and former British Army captain, was quoted admitting to fellow parkgoers that he'd never toasted marshmallows over a fire. Peeps' PR partner, Coyne, heard the news of the story on October 25 and immediately set to work on a strategy for the campaign. The concept of a royal invitation was developed and approved in coordination with the brand's in-house team within 24 hours. "For most opportunistic ideas, the biggest challenge we face is time," said Coyne EVP Lisa Wolleon. "The news cycle is constantly shifting, so we knew the Peeps brand had to act fast to respond in a timely manner while the news was still relevant." The brand decided the best way to reach Prince Harry was through social outreach to Markle, his then-girlfriend, soon-to-be fiancé. Markle, an American actress, has an active social following of nearly 500,000 on Twitter and 2.7 million on Instagram. With no paid support for the campaign, the brand wanted to create an invitation that would have a gripping visual component to help the story gain traction in media outlets, as well as on social media. "We pitched media contacts spanning entertainment, food, royal family, and lifestyle beats," explained Wolleon. On October 27, Peeps took to Twitter and reached out to Markle directly, sharing an article from HuffPost. 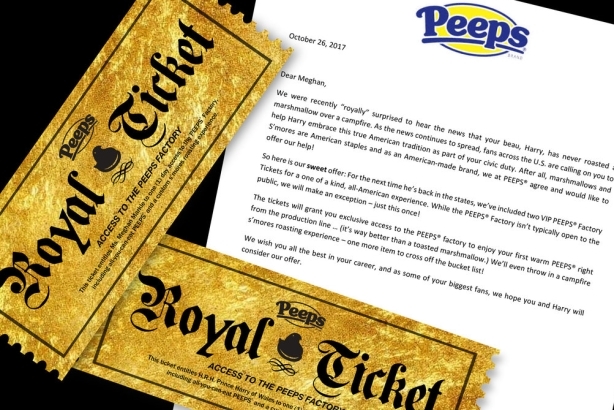 The campaign team also mailed Markle a package containing an official letter of invitation to the Peeps factory, two golden tickets, and some Peeps Delights. The letter includes a call-to-action for Markle to "help Harry embrace this true American tradition as part of your civic duty." The visual image of the golden tickets and official letter helped the brand in media outreach efforts. On October 30, The Daily Meal published an article about Peeps' mission to bring Markle and Prince Harry to tour the factory, which the brand shared on social. "We capitalized on the playfulness of the opportunity by adopting #ConvincethePrince as a fun way to personalize the message and get fans involved," added Wolleon. The campaign generated 11 media placements, 10 of which ran within three days of the initial media outreach effort. Feature placements for Peeps' invitation appeared in several top-tier outlets, including Chicago Tribune, Los Angeles Times, MSN, Delish, and Insider. The brand received 100 social engagements with fans on social within the first day of reaching out to Markle on Twitter, measured through likes, favorites and retweets. While specific figures were not available, the brand said the royal invitation campaign received double the number of engagements and outperformed all other brand content for this quarter.